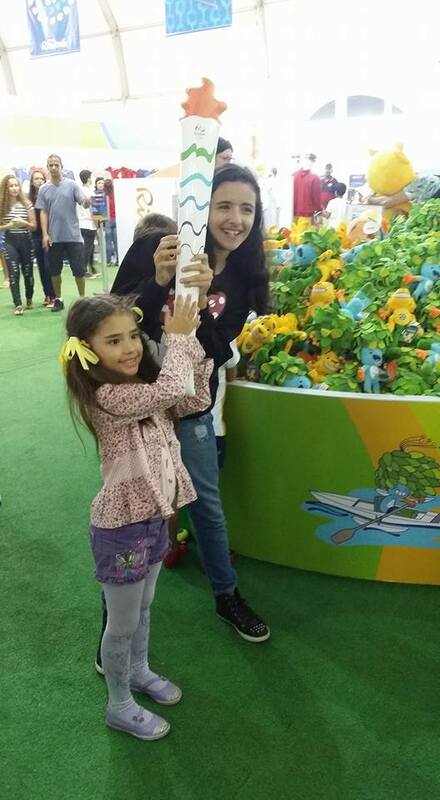 Saturday in the Olympic city presented several happy accidents. The day started with a stroll to USA House, the USOC's remote office and hospitality suite for the Games, to meet with a public relations colleague. 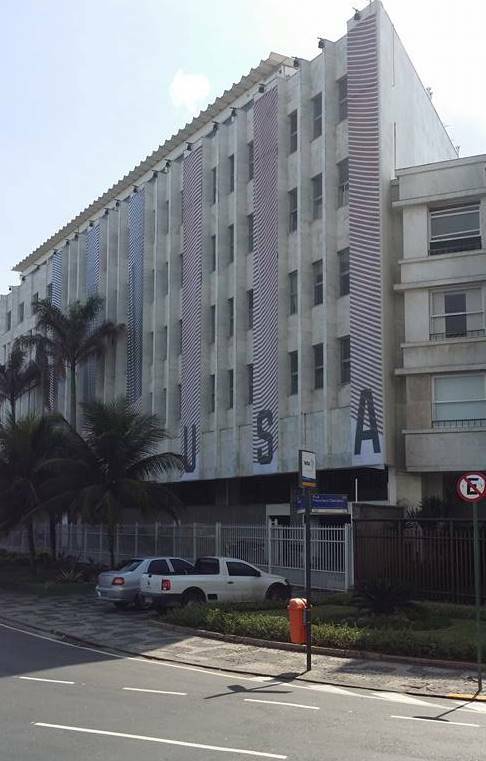 The house -- in a Rio school that Team USA is renovating -- remains an active construction site with painting, banner installation and other hard hat activities underway. I did not yet go inside, but it will be exciting to see how the location is transformed from now to volunteer training on Aug. 2. Bidding adieu to my colleague, I headed across the street to the east end of Ipanema Beach, eventually walking to the rocky peninsula that juts out into the Atlantic. 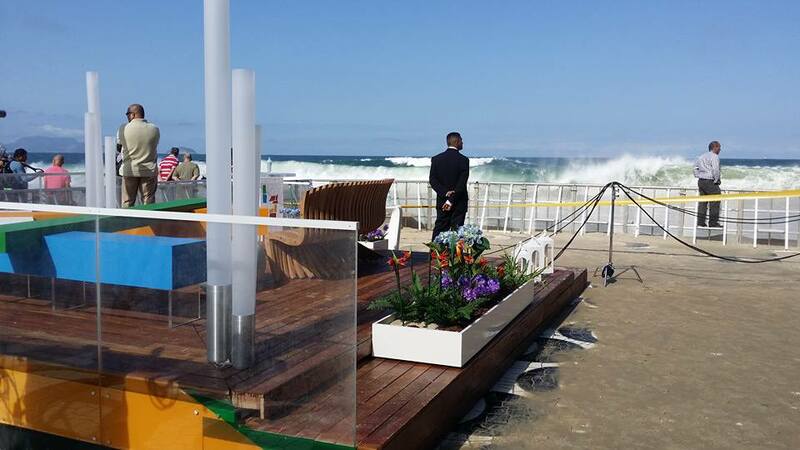 One of the remote Rio Media Center locations -- perhaps the most scenic of them all -- has a balcony and TV studios overlooking the most spectacular beach on earth. Donning a media credential I was afforded a few minutes to soak in the media center views before climbing what the house manager described as "Rio's ant hill" where thousands of locals and tourists gather to applaud the sunset on clear evenings. 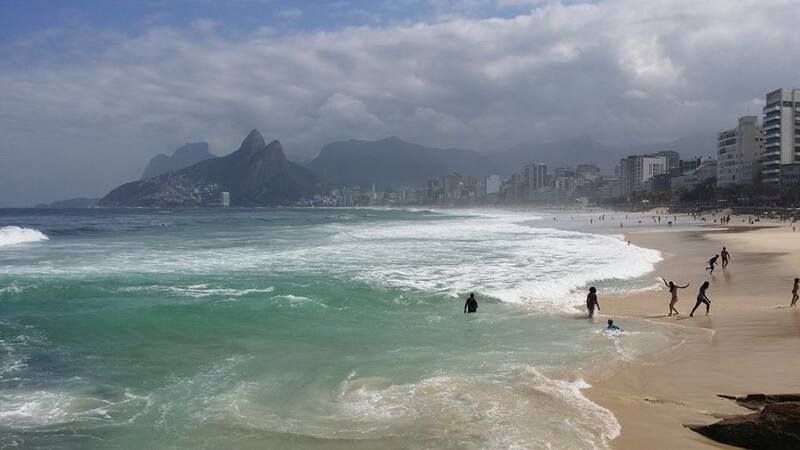 Something tells me these moments and views will remain all-time personal favorites from the 2016 Olympic experience as a wave of calm and peace of mind washed over me -- I will stress about Rio's five-ringed challenges no more! Heading past Fort Copacabana and through the peninsula neighborhood, several billboards for what may be the Russia House came into view. 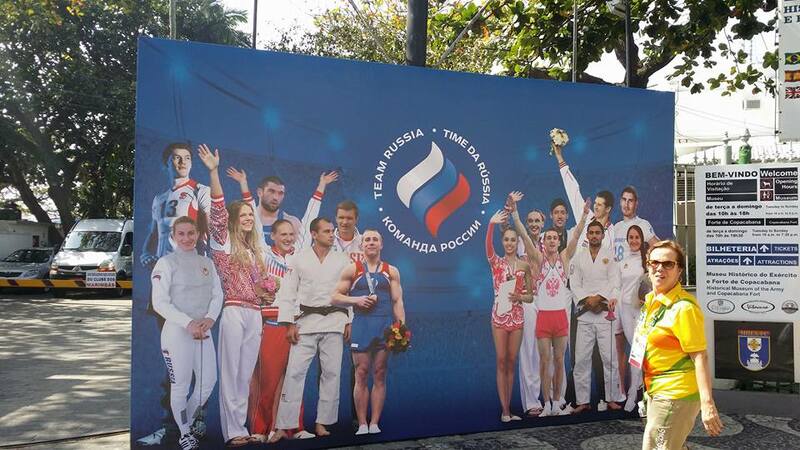 I could not help but wonder which athletes on the boards need to be painted over due to the Russia Olympic doping scandal -- the Russia House is typically a very popular venue -- wondering how it may be different in 2016. 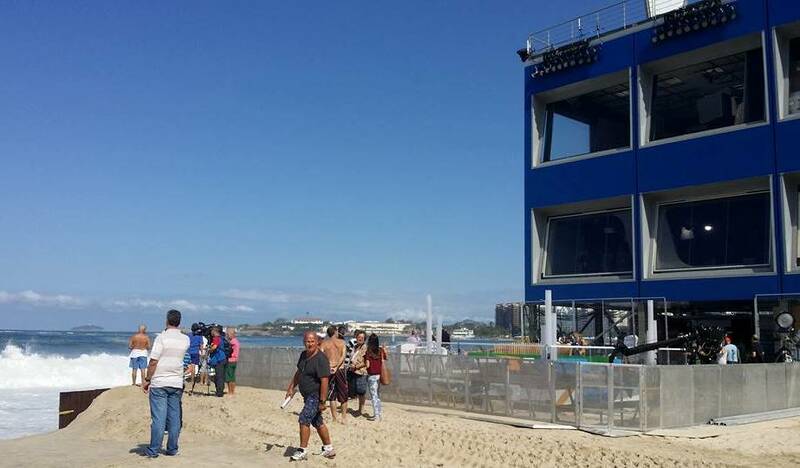 Moving on to Copacabana Beach, a large, blue box on the beach proved to be a television viewing stand with a bridge across Ave. Atlantica to connect it to a Rio 2016 Media Center. 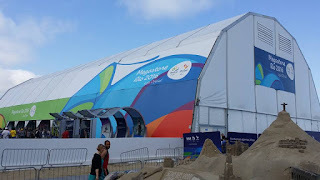 It was no accident the Games' most prominent broadcaster, NBC, occupied most if not all of the temporary compound. As I came around the side of the blue box, it was surprising to spot a bulldozer, yellow or red caution tape and a few additional security folks keeping an eye on a small crowd gathered to look at the building. Jutting out of the ground/beach level of the structure there was an elaborate and colorful TV studio -- I thought perhaps this was one of the TODAY Show sets. Flashing my Rio Media Center badge, I was permitted closer inspection alongside reporters from O Globo, APF and a few photographers. 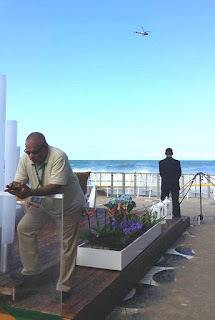 Stern faces on the NBC production team told the tale -- the entire set had moments earlier been drenched by a huge winter wave crashing onto Copacabana Beach. About this time the AFP reporter introduced himself asking my news outlet, and I explained the Olympic blogger status. "Well, here is your story today!" he said. I spoke with a couple of the NBC personnel who confirmed one oversized wave came up over their custom-installed mini-sea wall facing the ocean side of their temporary set. The swell was intense enough to lift and leave behind about an inch of sand on the decorative tile flooring that some team members were starting to sweep or clean with shovels and mops. The wave's watermark extended almost all the way to the main road. Other producers -- perhaps more senior NBC personnel -- exchanged hushed conversations while gazing upon the scene. About this time the O Globo reporter named Gabriella chatted up the cause of the surprise mayhem. "It is the ressaca -- the winter tides like the one that crashed the new bike path a few weeks ago," she said. As reported earlier this year, a new beachfront cycling structure was destroyed by a large wave, killing two riders. Apparently these winter tides bring a handful of larger waves which are impossible to predict. Thank goodness folks were only soaked by Saturday's wave! Most of the NBC folks started clamming up when they realized AFP, O Globo and bloggers were on the scene, but we did also confirm the furnished outdoor set is intended as the man NBC News, NBC Sports and Late Night programming with Carson Daly. Seems like the perfect time to fly in Ryan Seacrest. With no more set-drenching waves upon us during my hour around the set, I moved on to visit the Olympic Mega-Store across the street from the Copacabana Marriott (my 2005 Rio holiday accommodations). While staying at the hotel years ago, my then-girlfriend, her sister and I made friends with one of the masseuses employed by Marriott, but I learned he had long-since moved on from tourist muscle treatments. 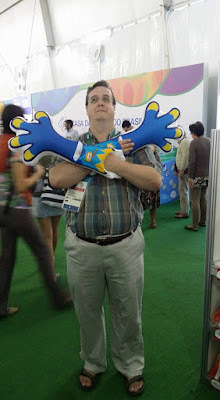 There are few items available for XXL (locally, size GG) male Olympic fan. The organizing committee was noticeably conservative with regards to Olympic pin designs (far fewer than in Athens, Beijing or London). 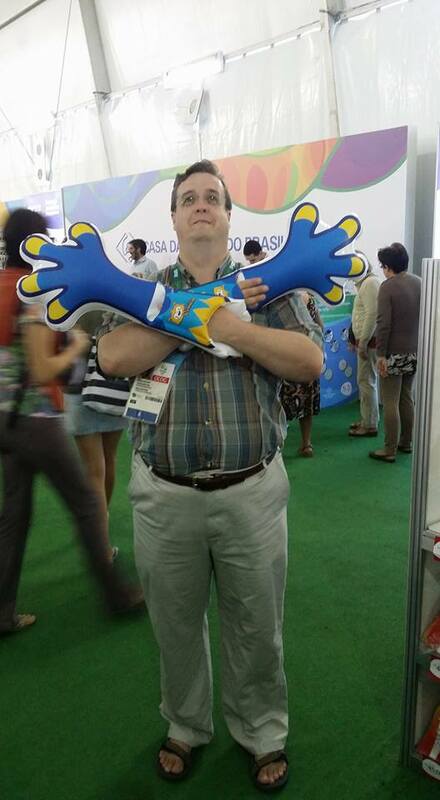 Inflatable fan gear apparently is popular -- people were snapping up oversized "mascot hands" for clapping and blow-up Rio Olympic torches (could these become this Olympiad's "red mittens" must-have souvenir?). Much of the beach gear and shirts is very colorful and festive. Just wish they had more of it in my size. I bumped into some of the students from Ball State University (first met at Rio Media Center on Friday) as they enjoyed the scene. 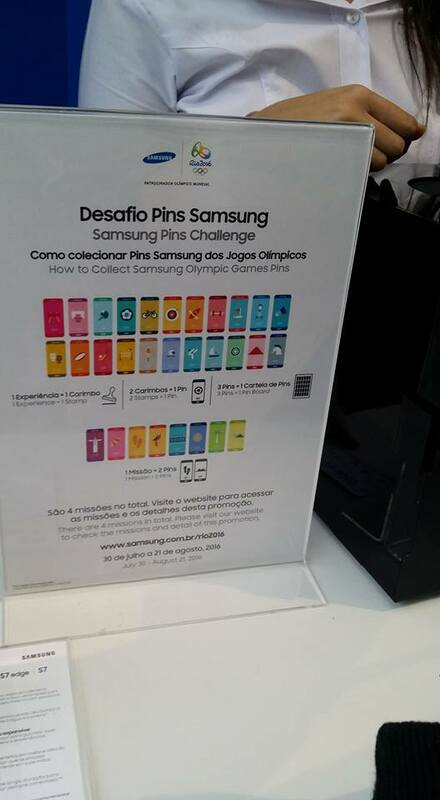 The next happy accident was spotting Samsung's pavilion adjacent to the Olympic store. It is sort of nondescript, mostly glass and marked with only subtle logos for the Worldwide Olympic partner brand. 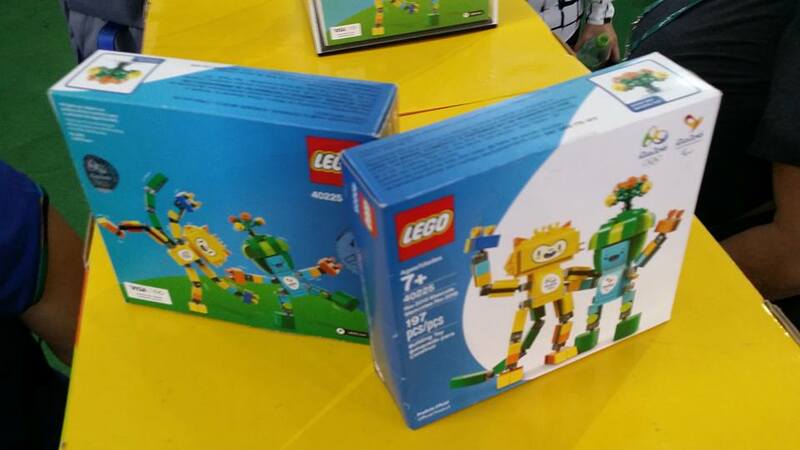 If you pull out of the box a design you already have, you are encouraged to exchange it with fellow collectors ("no returns" to the box for a another draw). 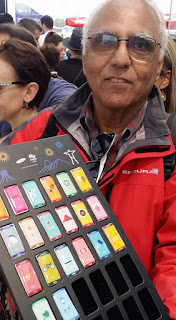 Eight of the designs are only available at the Barra location for Samsung, with another eight exclusive to Copacabana, but the manager and translator smiled and said they would not reveal which eight are specific to the two pavilions. I managed to earn or trade for 11 of the designs, and all were for sports, leading me to believe the eight local icon designs are either Barra-specific or they will be blended into the giveaways during the Games (akin to the U.K. icons suddenly appearing later in the London 2012 Samsung pin program). 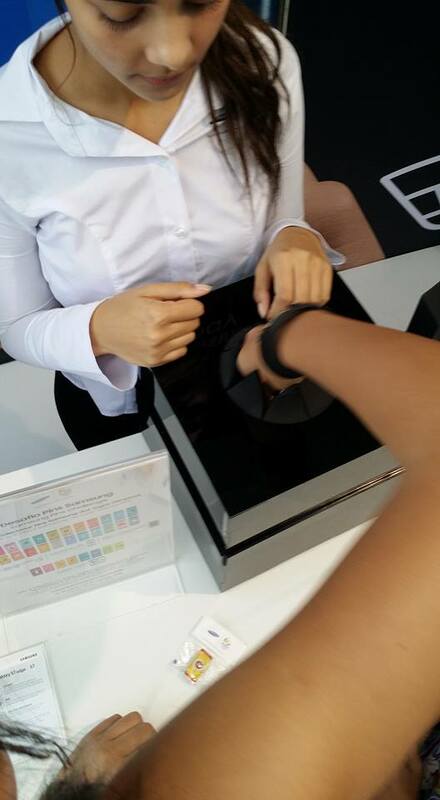 Let the Samsung pin games commence! My final three serendipitous moments of Saturday: Arriving at Co-Sport to collect my tickets two days before their ticketing center opens (oh, well); crossing paths with a U.S.O.C. friend while ordering pizza near the hotel (fun albeit brief visit); and stumbling in to a late-night dinner at the Veloso bar-cafe, now the Garota de Ipanema Cafe, the actual location where the world's second-most recorded pop song was written as inspired by a passerby teenage Girl from Ipanema. 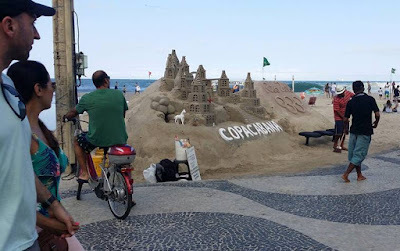 It was only after two caipirinhas that I noticed the writing on the wall (large, framed images of the hand-written music). Great fun to learn the back-story for the song while enjoying a wonderful meal.